Libby, a certified camp director by the State of Connecticut, is assistant director of the Ammerman Center for Arts & Technology at Connecticut College and has worked at Mystic Seaport & New London Landmarks. She received a B.A. in Art and Art History from Connecticut College. This is her 21st year at Arts Camp. Ann has a BFA in dance from Ohio State Univ. and a MAT and K-6 teacher certification from Conn. College. She was Assoc. Dir.of the Creative Dance Continuum for 15 years and has taught at Conn.College, Three Rivers, the National Theater Institute and the Regional Multicultural Magnet School. Currently she is the administrative asst, to the Conn. College Writing Center and the faculty Center for Teaching and Learning. This is Ann’s 1st year at Arts Camp. Jeannie recently retired as the Chair of the Fine Arts Department at Pine Point School in Stonington, CT where she taught dance and creative movement for the past 38 years. 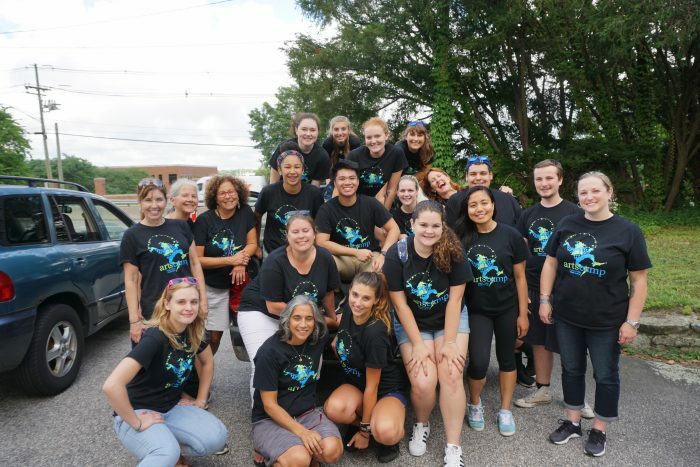 Movement education is a strong component to the education of the whole child at Pine Point, and she has enjoyed fostering the creativity, self-expression and the understanding of the elements of dance with her students. Even though she has enjoyed studying and teaching many dance forms, she considers herself a modern dancer and enjoys choreographing for herself and others. This is her 17th year at Arts Camp. Maria Iacoi received her Masters from Wesleyan University and has been teaching Art at Pine Point School for 29 years. Her Art education goals are to make connections with other subjects and causes and community outreach. She strives to teach her students to better appreciate art and its vital role in society, while learning to better communicate through visual expression. Maria also creates whimsical masks, costumes, sets and unique props for all the musicals at Pine Point. This is Maria’s 14th year at Arts Camp. Bethany is a graduate of the University of Rhode Island. She studied Music Education and Music History with a concentration in voice. She currently teaches Middle School music at the Pine Point School in Stonington, CT, conducts professionally, and has a large private studio. She has been the musical director for several middle school and high school programs in Connecticut and Rhode Island. Her favorite show to direct thus far has been “Wonderful Town.” She has no greater joy than when she is singing or working in the theater. This is Bethany’s 3rd year at Arts Camp. Monique earned a Masters in Education and a BA in Music. She has had a variety of jobs ranging from radio, cruise ship entertainment, acting, and television host to news reporter. She enjoys teaching music to young children. Monique is an Emmy award winning reporter and won best supporting actress at the NY Int’l film festival. Monique works for Middletown Public Schools teaching Language Arts and is the co-advisor for the school’s award-winning anti-bullying program. She is proud of her students who create social change through the performing arts. In 2016, she played Velma in East Lyme Regional Theater’s “Hairspray”. In addition, she performed in the anti-bullying musical, “Her Song” at the Ivoryton Playhouse This is Monique’s 12th year at Arts Camp. Lisa works at the Lebanon Elementary School and has almost 20 years experience working in Early Childhood Education. Lisa is finishing her Visual Fine Arts Degree at Three Rivers Community College. She shares her love of art by focusing on both creativity and technique, and enjoys drawing, photography, ceramics, painting and pastels. This is Lisa’s first year at Arts Camp.